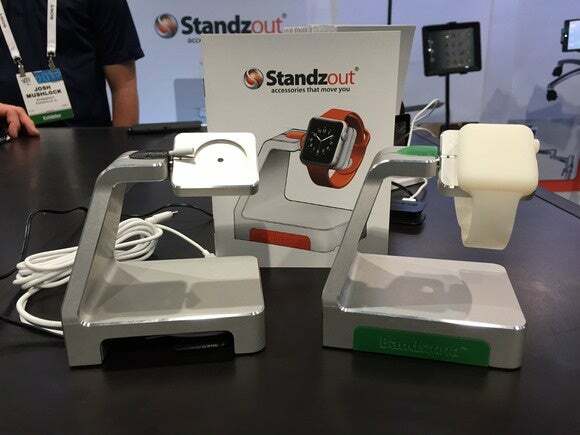 In a quiet corner of the North Hall, Standzout showed off the Bandstand, an aluminum stand for the Apple Watch, slightly reminiscent of an iMac’s stand, only thicker to accommodate three USB ports tucked away under the bottom. Your Apple Watch connects to its included inductive charger, which rests in a cutout on top of the Bandstand and plugs into one of the USB ports. So don’t think of this stand as an extra charger for your watch, but rather as a place to keep the charger plugged in, while displaying the watch like the work of art it is. The Bandstand has a place for you to thread the charger, including cord management, and the piece on the top, where your watch’s face will rest, actually swivels, so if you keep this on your nightstand you could turn the watch’s face so you can easily view it from your bed. The other two USB ports have enough power to charge your iPhone and iPad at the same time as they charge your watch—you could park your iPhone on the little shelf below the watch stand’s arm, I guess, or keep it on the table next to the Bandstand. I’m sure this isn’t the only Apple Watch stand we’ll see when Apple rolls out its next big thing sometime this spring (the latest rumors point to March). But in my brief time with it at CES, I came away impressed with the Bandstand’s build quality. Standzout estimates a final price of around $70, but exact pricing and release date are still to be determined. That strikes me as a little high for just a stand and three-port charging station, but since the Apple Watch will probably need charging every night, you might as well have somewhere nice to put it.